I worked with a client a few weeks back, and we were discussing strategies to be more confident in life. I caught myself saying the following statements. They appeared to strike a deep chord with my client, so I felt to share them with you. Being YOU takes no effort. It takes no effort to be confident to be YOU. It takes great effort to try to be somebody other than yourself. Efforting to be somebody else is exhausting. Realise that, being YOU takes no effort. It takes no effort to be YOU. When you are totally in love with yourself, you give yourself permission to go out and, well, just be YOU! One of the first places that we can go out into the world and just be ourselves is through self love. Friends, self love IS the key. The subject of self love often appears when I'm working with clients and it is usually met with the revelatory retort… "But, how do I love myself? I've never been told that was important. I've never been told how to do that." Confidence starts with self love. Fall in love with yourself – Think of yourself as being a beautiful flower. A flower needs nourishing soil, it needs sunshine, it needs watering and it needs a nurturing environment. Take a moment to use that metaphor to reflect on your own life situation. How is the flower that is you, self-loved? I'm not inviting you to stand in soil, in the sunshine and pour water over yourself (though that'd be quite sensory). I'm inviting you to deeply consider the environmental changes that you can make that will allow you to fall in love with yourself, deeper and deeper. Love yourself for all the good that you see and be kind and gentle to perceived imperfections. Be YOU, it takes no effort. Look after your body – This is sooooo fundamental to self love. Your body is your temple, it is the only place you have to live and worship from. It is your responsibility to keep the temple loved, respected, and cared for. Nutrition, exercise, sleep, fun and spiritual practice all contribute to a respected body. Learn to see beauty – When you can see the beauty in everything, you open yourself to seeing the beauty in yourself. See the beauty in other people, the babble of a brook, the struggle of a dad, the blush in a mirror. ​​Confidence is the fragrance of self love. The truth is that the barriers we experience to confidence and self love are invisible ones that live inside of us. We may not even know they are there, but they have a tremendous impact on our lives. And until we are willing to identify and move through those barriers, creating change at the most profound levels of our being, we won't be able to truly live our greatest future, not to mention go out and create a new world. How could you give yourself more self love yourself today? How could you express that self love as confidence? How could your confidence allow you to just be you? What are you going to do with all the energy you have liberated? Life Coaching is about supporting people through change. Rather than coercing and bludgeoning yourself into making a change, I can hold a coaching space for you that sponsors change from a deeper place. Together we can explore the philosophies of living powerfully. Let us Know the higher realm and deeper truths, know the beauty of life, and know the fulfilment of growth. Our work together can transcend whatever situation you find yourself in, wherever you started from. Often, when there is no mystical element to life, no magical discovery, no elevated order, we feel lost. What if intelligence were everywhere, not just in our heads. If you are in tune with the Truth, then the time to change will come at the right time. If you are going to be an confident individual... How do you do it? How do you get confidence to do it? How can you change your world and therefore, the World? I can help, do give me a call. 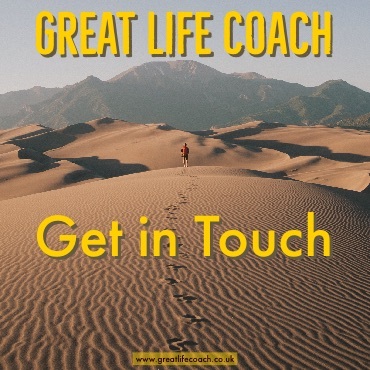 Make an Enquiry - Great Life Coach Life Coaching and Professional Coaching for Individuals Get in Touch Today I offer the following custom life coaching programs. choose which one suits you or go here if you are uncertain.